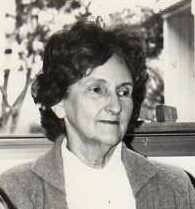 Vera Landrigan arrived at Dixons Creek in 1946 as a young teacher at Dixons Creek State School. After her marriage to Ron Adams of Steels Creek in 1947 Vera settled in as a resident and teacher at Steels Creek until they started a family. When her two sons, Stephen (1949) and Denis (1951) had reached school age Vera took up a post as sole teacher at Steels Creek in 1955. She soon established a reputation as a skilled and caring teacher, respected by the students and parents alike. Ron died as the result of an accident on Anzac Day 1963 at Croydon but Vera and her boys remained at Steels Creek, an integral part of the close knit rural community. Vera's keen observations of the people and activities that made up the community were published by the Yarra Glen & District Historical Society in 2005: Steels Creek a social history, 19461995.